As a members of the CML DuraTALK family of digital voice products, the CMX608/CMX618/CMX638 are flexible, high integration, high performance, RALCWI Vocoders, offering near toll-quality voice at very low bit rates. A Forward Error Correction (FEC) engine provides optimum performance in real life applications. The RALCWI Vocoder comprises four independent functions which are selectable by the host: Voice Encoder, FEC Encoder, Voice Decoder and FEC Decoder. 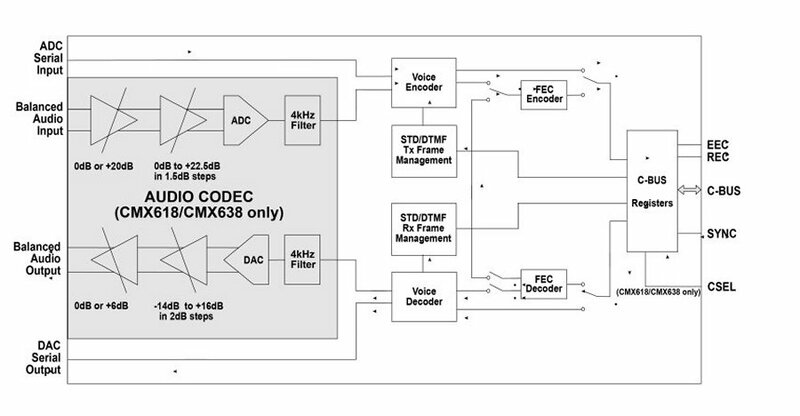 The CMX618 includes an integrated voice CODEC, offering a complete analogue voice to low bit rate vocoded data function, with integrated channel filters removing the need for external components, whereas the CMX608 requires an external voice CODEC. All three devices operate from a dual power supply (1.8V and 3.3V) and are available in both 48-pin LQFP (L4) and 48-pin VQFN (Q3) packages. Q: My EV6180 Evaluation Kit will not operate when JP2 is fitted. Why is this? A: JP2 connects the hard-reset circuit on the EV6180 to pin 16 of the C-BUS connector J3. On the PE0003, this pin is set to input by default and a weak pull-up applied. It is possible that the reset signal will be applied until C-BUS pin 16 is actively driven low by a PE0003 script. Removing JP2 disconnects the hard-reset circuit from C-BUS pin 16. The power-on reset and the C-BUS General Reset command will function as normal with JP2 removed. Optimising the speech quality using both manual and autonomous techniques to set the input gain. Go to scripts tab to download the scripts for this app note. Demonstration scripts for the PE0003 and EV6180 kits. Please refer to "ReadMe.txt" for a description and supporting Application Note information.